Two games were on tap in the National Hockey League last night, both highlighted by strong goaltending performances by the winning teams’ netminders. 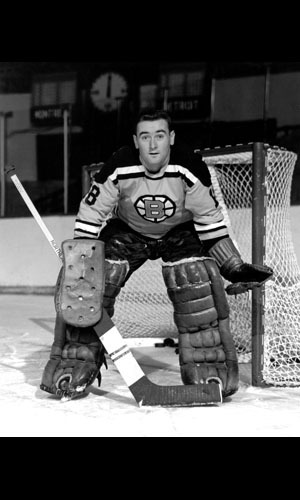 In Boston, Bruins’ left winger Dean Prentice scored two goals, but the real hero on the night was goalkeeper Ed Johnston as they edged the Chicago Black Hawks 3-2. Johnston got in the way of 41 Chicago shots to steal a win for the Bruins. His finest moment came with one second left in the contest when he stoned the Hawks’ Stan Mikita with a spectacular save on a shot from the blue line. Black Hawks goalie Glenn Hall was on the bench in favour of the extra skater at the time. After a scoreless first frame, Prentice counted two goals for the Bruins within the first eight minutes of the second period. John Bucyk upped the Boston lead to three just past the half-way mark. The Beantowners then turned things over to Johnston to hold off the Hawks the rest of the way. Chicago mounted a furious assault on the Boston goal in the final 20 minutes, firing 15 shots at a beleaguered Johnston. They did manage to draw to within one goal, thanks to the first goals of the year for defencemen Matt Ravlich and Elmer (Moose) Vasko. The goals came within 36 seconds of each other at the start of the period and may have served as a wake-up call for Johnston, who was outstanding the rest of the way. At the Olympia Stadium in Detroit, 14,493 fans, the largest Detroit crowd of the season, saw the high-flying Red Wings claim a narrow 2-1 victory over the Montreal Canadiens. Once again (and this is a familiar refrain these days) it was rookie backstop Roger Crozier who was the difference. Crozier had a very easy time of it early on and was forced to make only two saves for the entire first period. However, the Canadiens came on as the night wore on, and he was at his best in the final frame, making 13 stops. Detroit grabbed a 2-0 first period lead on goals by Parker MacDonald and Norm Ullman, who is having a fine season so far. 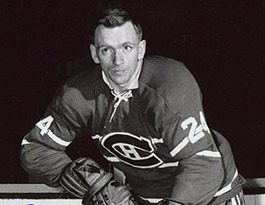 The Habs got one goal back on a Claude Provost marker in the second, but were unable to beat Crozier after that. Roger Crozier’s amazing rookie story continued this weekend against the mighty Habs. 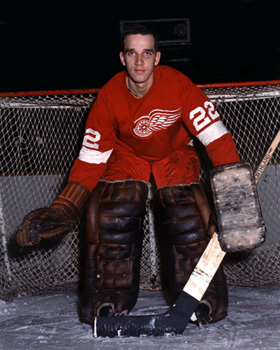 The Red Wings actually would have had a larger margin of victory had it not been for the fine work of Charlie Hodge between the pipes for Montreal. The little puck stopper made 33 saves. His best were against Ted Lindsay, who is still looking for his first goal, Norm Ullman, Bill Gadsby and Bruce MacGregor. NHL President Clarence Campbell was the keynote speaker at the 31st annual meeting of the Ontario Minor Hockey Association this weekend. Campbell spoke of the advantages for young men making hockey a full-time career. Campbell said that while the sport often conflicts with a player’s education, it can be very rewarding to the many students who don’t find their way to universities. Campbell said that the average base salary in the National Hockey League is $14,368 per year. He also noted that when league and team bonuses are factored in, the average is closer to $19,000. He said that there is an abundance of jobs in professional hockey, with over 500 players employed through the four professional leagues (NHL, AHL, WHL and CPHL). However, only about 120 men find work at the top NHL level. The six NHL teams have agreed to be non-competitive in bidding rights for immature players. This came about after about $10,000 was offered to a lad of 14 to leave home and go to a sponsored club. The OMHA also approved a rule stating that all players except for goaltenders must wear a helmet fastened by way of a chin strap. In the American Hockey League last evening, the powerful Quebec Aces put on a great show for over 9,000 home-ice fans as they demolished the Springfield Indians by an 8-0 score. In the other AHL game, Hershey defeated the Buffalo Bisons 4-2. Springfield came into Quebec riding a 5-game unbeaten string and seemed poised to make a run at the Aces for first place in the league’s Eastern Division. As if in response to the challenge, Quebec thoroughly outclassed the visitors and left no doubt as to who is the top team in the division at this point in the season. The contest was close for one period, as the Aces took a 1-0 lead on a Bill Sutherland tally. They broke it wide open in the sandwich session, scoring six times to remove all doubt about the outcome. In addition to Sutherland’s goal, Red Berenson and Jean-Guy Gendron scored two apiece. Other Quebec marksmen were Terry Gray, Wayne Hicks and Ed Hoekstra. Gump Worsley had a fairly easy time of it in goal for Quebec, facing only 23 Indian shots. Springfield’s Jacques Caron was much busier, managing to stop 34 of 42 Ace attempts on the Indians’ net. A wild first period saw the Bears take a 2-0 lead, only to surrender that right back to the Bisons. Pete Conacher and Wayne Rivers had put the Bears in front, but Len Lunde and defenceman John Miszuk evened it up before the first frame came to an end. Bisons’ netminder Ed Chadwick earned an assist on the Miszuk goal. Danny Poliziani and Myron Stankiewicz scored late in the second period to put the Bears in front for good. The third period was all Buffalo as they outshot the visitors 16-5, but they were unable to find a chink in the armour of Hershey backstop Claude Dufour, who effectively shut the door. In the Western Hockey League, the Seattle Totems moved into first place on the weekend after playing two games in which they did not score a goal. After being shut out by Victoria 2-0 on Saturday evening, the Totems battled the Los Angeles Blades to a 0-0 tie Sunday. The single point put Seattle one ahead of second place Portland. In OHA Junior A play yesterday, Oshawa took over first place with their second win of the weekend. They slipped by the Montreal Junior Canadiens 3-2, thanks to a winning goal by Bobby Orr. It was quite a weekend for Orr, who scored two goals for the Generals on Saturday. He now has 10 goals in 12 games this season. The league saw three other Sunday contests: Niagara Falls was shocked 3-0 by last-place Kitchener, Toronto edged Peterborough 4-3 and St. Catharines held on for a 4-3 win over Hamilton. In Toronto, before nearly 6,000 fans, Marlies goalkeeper Gerry Desjardins was the hero as he staved off a late Peterborough rally to preserve 4-3 win. Barry Watson scored twice for Toronto, with Jack Chipchase and Mike Corrigan netting singles. Danny Grant, with two scores, and Andre Lacriox replied for the Petes. 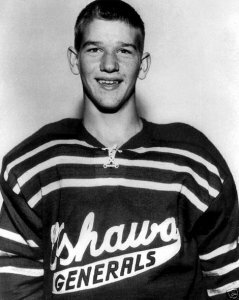 In Niagara Falls, Ken Gratton, Bob Jones and Peter Brennan fired the Rangers goals to down the Flyers, Niagara captain Bill Goldsworthy received two 10-minute misconduct penalties and a game misconduct in the third period. St. Catharines took a 4-0 lead in their home-ice win over Hamilton. Ken Hodge score three times for the Black Hawks, with Brian McDonald adding the other. 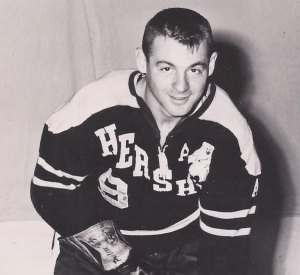 Hamilton scorers were Peter Mahovlich, Freddie Speck and Jim Mair.